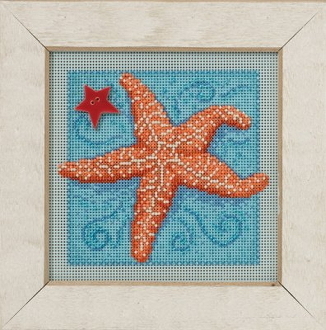 A beach inspired themed kit depicting a Starfish. Adorn with the enclosed Mill Hill ceramic Star button. Design size: 5" x 4.5" (12.7 cm x 11.4 cm). Mill Hill Glass Beads, Mill Hill ceramic button, 14 count Perforated Paper, floss, needles and chart with instructions. Frame sold separately, see item 40-436 Antique White frame (GBFRM10).